I never watch cooking shows. While I do cook dinner -most nights, I confess to having take-out menus inside my favorite hard-copy cookbook. My favorite actual cookbook is the Google search engine in which I can list “recipe black beans eggs” if that’s what I have or crave, and it offers up over 11 million possibilities. That said, we all have nights where we go to the refrigerator to get dinner together and don’t find the makings of what appeals or what works in the time you have. This happened to me recently. But as I mentally combined ingredients, then subtracted the ones we didn’t have enough of or time to mess with, I did discover a combination that worked. I warned my husband that it was an experiment as we sat down together. The meal was delicious and he reported that it was also great for lunch the next day. 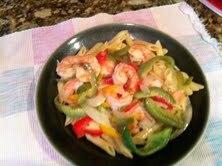 So, while its not brain surgery, I offer up my Shrimp and Peppers Pasta. Enjoy! An opened bag of cooked frozen shrimp that I found and checked for freezer burn while looking for the vegetables. Dust off top of pasta box before opening. If using fresh vegetables, clean and slice peppers and onions into preferred size. Thaw frozen shrimp by running water over it in colander. Cook the pasta according to the package directions. Drain, return it to the pot, and toss with a little (1/2 tsp) olive oil. Heat 1 Tbsp olive oil . Add vegetables and minced garlic. Cook until crisp tender. Add shrimp for a few minutes until warm. If using frozen vegetables, drain liquid. Add 8 oz. Citrus-Dill marinade. Serve combination over pasta and enjoy! Categories: family, Life, recipe, Uncategorized | Tags: dinner, pasta, recipe, shrimp, Wegman's citrus dill marinade | Permalink.